Paradise by the dashboard light? I would do anything for love, but I won’t do that….what was it he wouldn’t do? Oh how we loved Meat Loaf. His music was playing at every party I went to as a teen. Years later I found myself in Vie ques Puerto Rico, sitting on a fence in front of my friends apartment, waiting for his downstairs neighbor, Meat Loaf, to exit his apartment….I never did see him that day. But I did see him at the Bangor Auditorium in the 70’s for about 8 bucks. Ha! Meatloaf brings me back to my childhood…. Meat Loaf the singer and meatloaf the recipe. A cold rainy day in Maine is calling for some comfort food. “Bat out of Hell” shall go on the turn table and a chicken meatloaf shall be prepared. A meatloaf recipe is as varied as the cook who makes it. 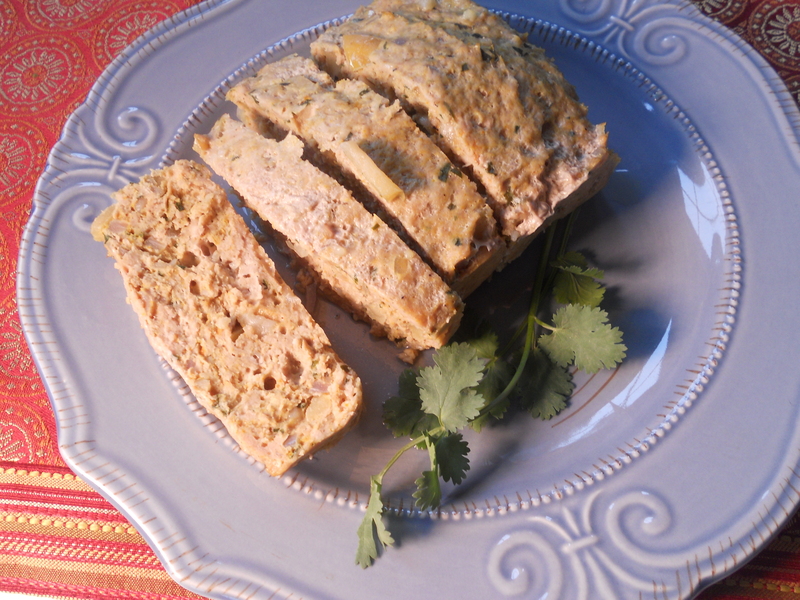 Whether you prefer ground turkey, ground chicken or beef, adding a variety of fresh herbs, spices, fresh veggies or even fruit to your meatloaf promises a new experience of warm bold flavors. What’s in the fridge? 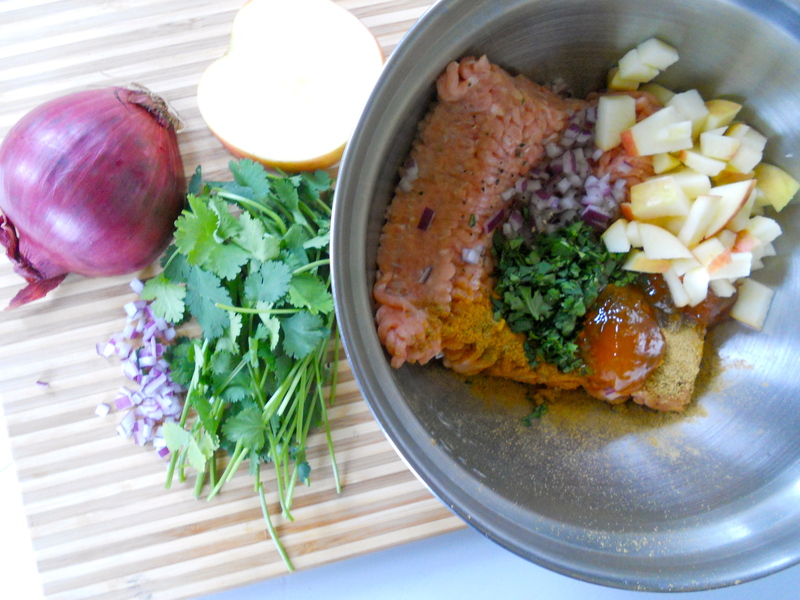 Onions, cilantro, left over apple, apricot jam and from the cupboard, cumin, curry and some rice crackers…. Just a small amount, and quickly cooked in the toaster oven. It set up nicely and smelled wonderful. Sweet Potatoes also went into the toaster oven. And a quick mix of curry and mayo for a little dippin’ sauce….superb! MIX ALL INGREDIENTS. SPRAY A BAKING DISH OR BREAD PAN WITH PAM. COVER AND BAKE FOR 30 TO 40 MINUTES ON 350 DEGREES. REMOVE FROM OVEN. REMOVE FROM BAKING DISH AND SLICE. 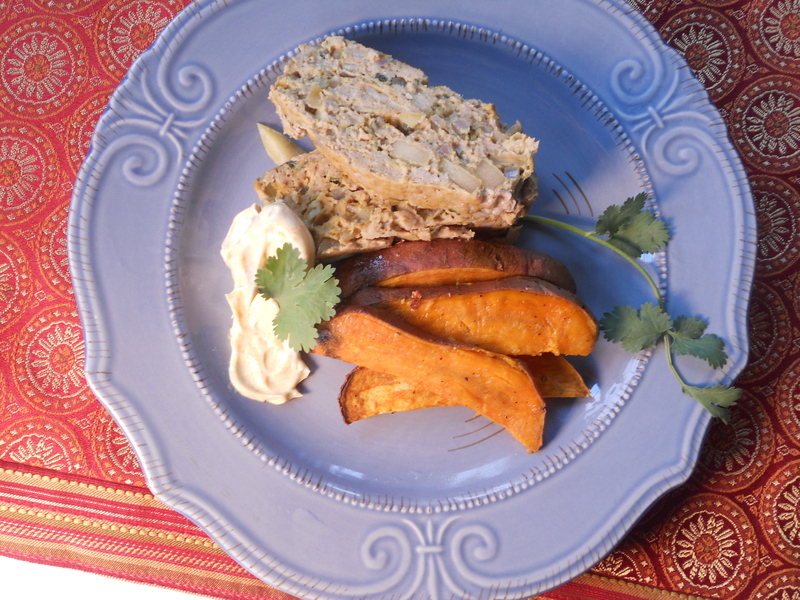 SLICE SWEET POTATOES AND TOSS IN OLIVE OIL S &P. BAKE IN A SINGLE LAYER IN SAME OVEN UNTIL LIGHTLY BROWNED ON EDGES. SERVE AS SIDE DISH WITH MEAT LOAF. DO YOU HAVE A MEATLOAF RECIPE YOU WOULD BE WILLING TO SHARE? My Dad gave me a great gift when I was 12 years old. He taught me how to make sauce and meatballs. He was the chef in our home and a hot meal was on the table every day at 4pm. It was called supper, accompanied with a stack of white bread and butter. Through the years I have been adjusting the recipe, incorporating fresh ingredients. Whole fresh tomatoes have replaced the canned tomatoes and fresh garlic has replaced garlic powder. Although his recipe was wonderful, I opt for market fresh ingredients and am forever changing the recipe. This time I was inspired by Jamie Oliver. He incorporated fresh rosemary into his mini meatballs. What an interesting idea. If you chose to use Jamie’s recipe, be careful to mix ingredients until they are just combined, otherwise you will end up with overly tough meatballs. Speaking from experience….. I chose ground beef for this dish, a small amount, for tonight I am cooking for one. I mixed in finely shredded carrot, fresh chopped rosemary, chopped garlic, red onion and salt and pepper. Shredded carrot and other vegetables are always found with in my dishes. It was meant to encourage my son Colby to eat his vegetables. I put vegetables where you would least expect them. Back to meatballs…..mix the ingredients just til combined, form cute little meatballs, place them on a baking dish and into an oven at 325 degrees. Cook just til browned and finish them off in a delicious red sauce. 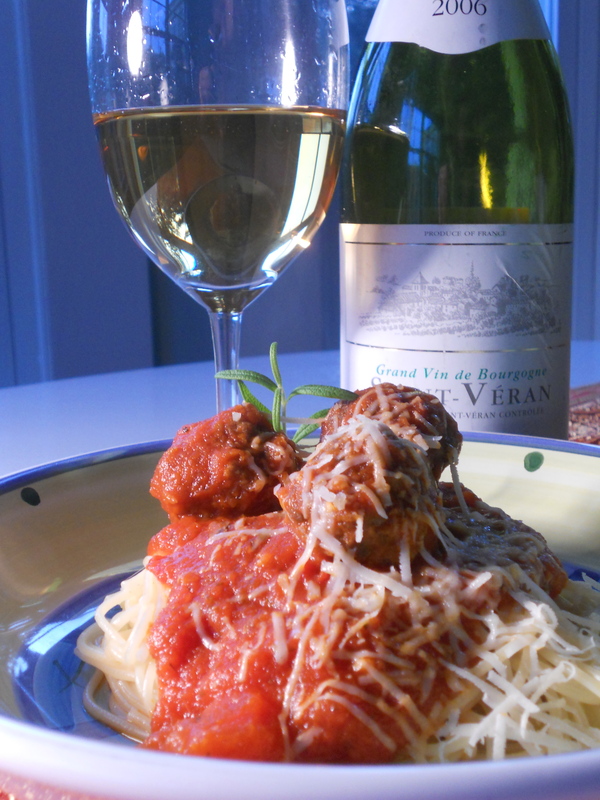 Serve over angel hair pasta and top with fresh grated Parmesan. SAUTE THE ONION & FRESH TOMATO OVER MEDIUM HEAT. ADD THE GARLIC AND FRESH HERBS. ADD THE TOMATO PASTE AND STIR. ADD THE TWO CANS OF TOMATO SAUCE AND S & P TO TASTE. ADD MEATBALLS AND SIMMER GENTLY OVER LOW HEAT FOR ONE HOUR. 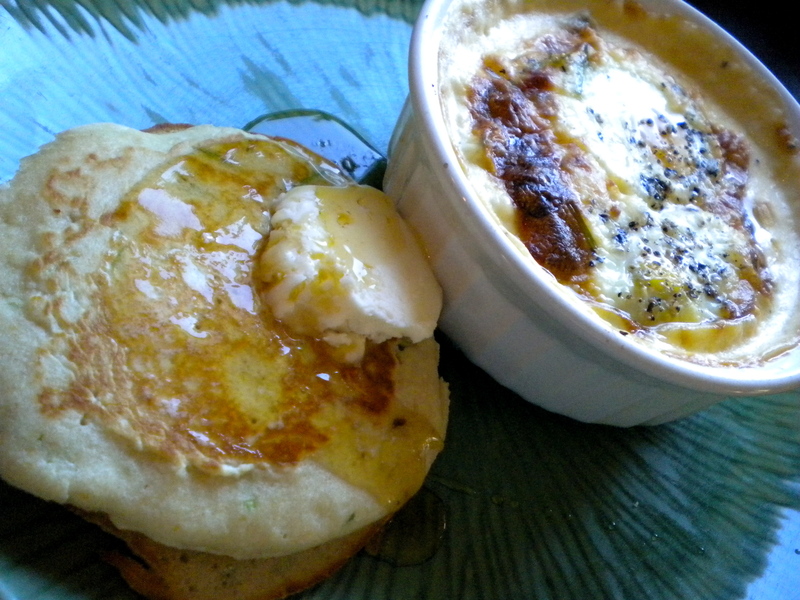 Romance your morning taste buds with this simple egg dish. 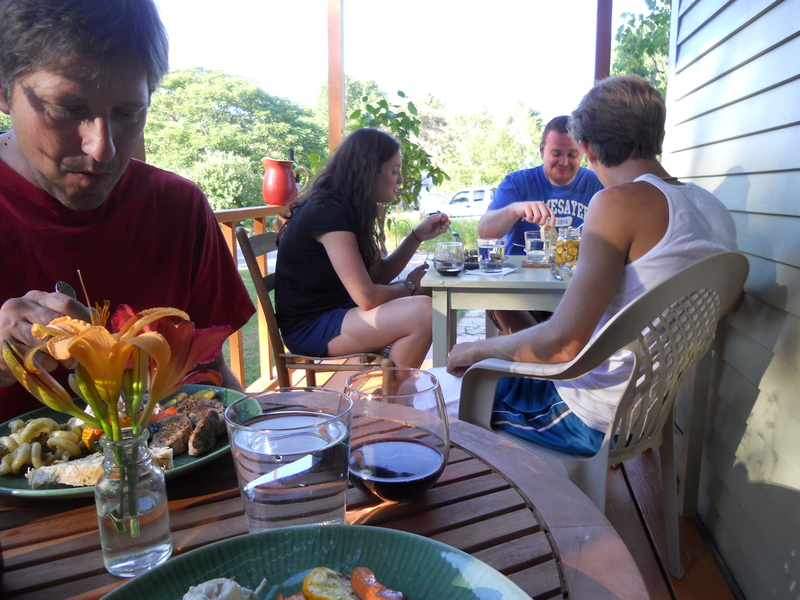 Impress your family and friends…..My morning was calling for protein before I ventured off to the gym. I wanted to make a quiche with out the crust. Perhaps that is a “souffle”. Hmmm, “Souffle”…..The term souffle seems so intimidating, so snobby, and my fear was an egg pie, stuck to the pie plate. 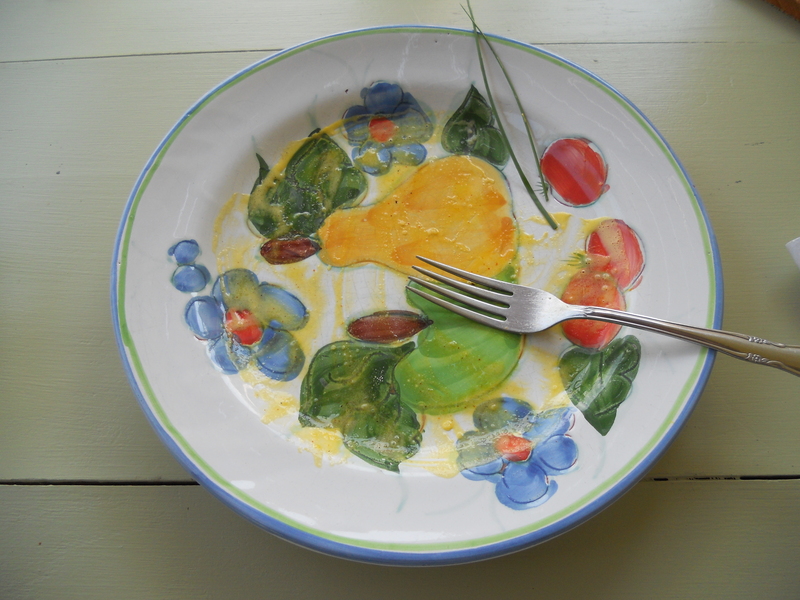 But what a lovely surprise I encountered….A delicious Fritatta! Beat 9 eggs, S & P, and 3/4 cup milk, and set aside. 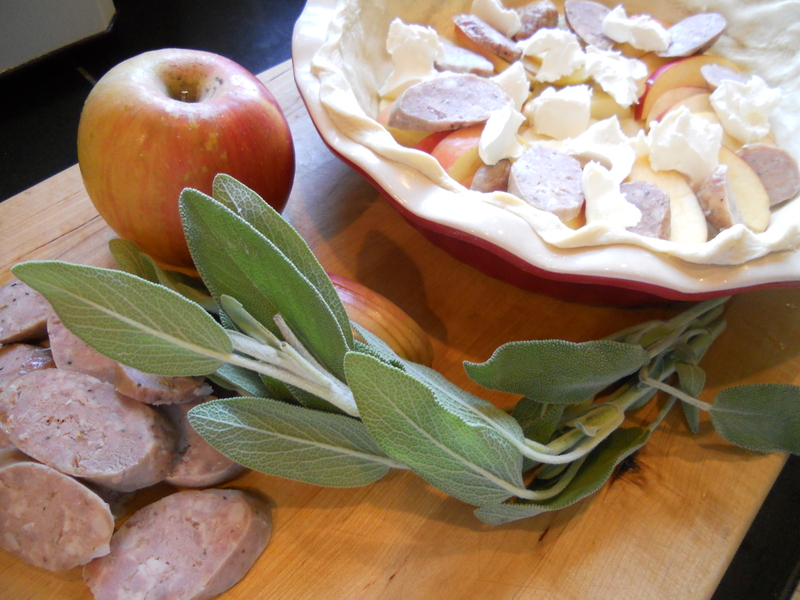 Layer anything you desire…I used the following: fresh sage, apples, sage sausage and cream cheese. Pour on the egg batter. Bake for about 40 minutes on 350 or until the center is cooked. Remove from oven. Let it set up at room temp for about 20 minutes and then slice yourself a delicious piece. It was wonderful. I celebrate life one crumb at a time. I may multitask the hell out of my day, but it’s the littlest things that make me so happy. Take for instance, the Walmart pool. 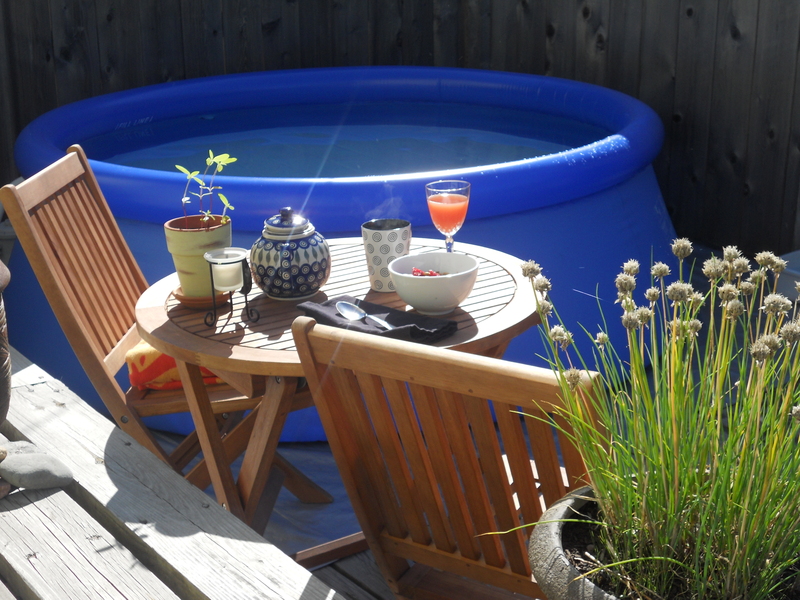 I spent my summer in the smallest pool with the biggest smile on my face. But one swipe of Little Banjo’s bird slicing claw and the pool is now in the recycle bin. Summer is over. It’s time for new projects and time to think autumn. Fall is no doubt a beautiful time of year with plenty to look forward to, but am I ready to embrace it? There is still an abundance of chives & tomatoes in our garden and there is still a beautiful selection of peaches at the local market. Sometimes I find myself over filling my basket with beautiful ripe peaches. I think to myself, am I crazy? What will I do with all these peaches? I may be a chocolate girl, but peaches will always have my heart. Hmmmm….chocolate and peaches? 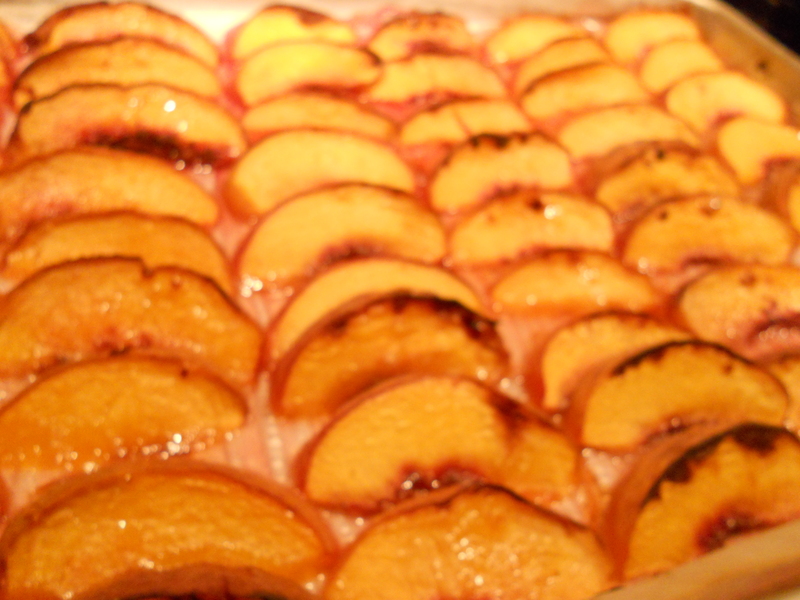 Remove your caramelized roasted peaches, let them cool and store them in a container on layers of parchment paper. Include the sticky sweet syrup that resides on the sheet pan. The peaches will keep in the fridge for about a week or freeze them! 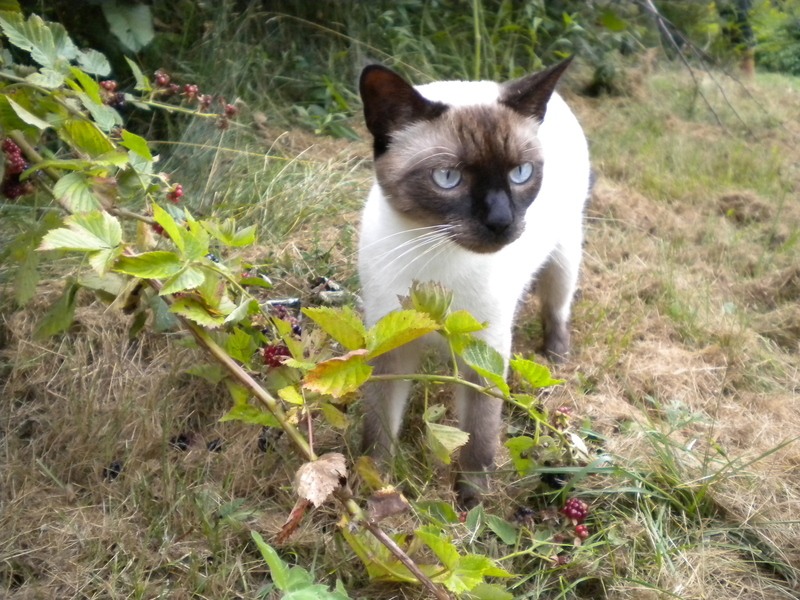 It’s nice to wake up in the morning and gather fresh berries with Little Banjo. 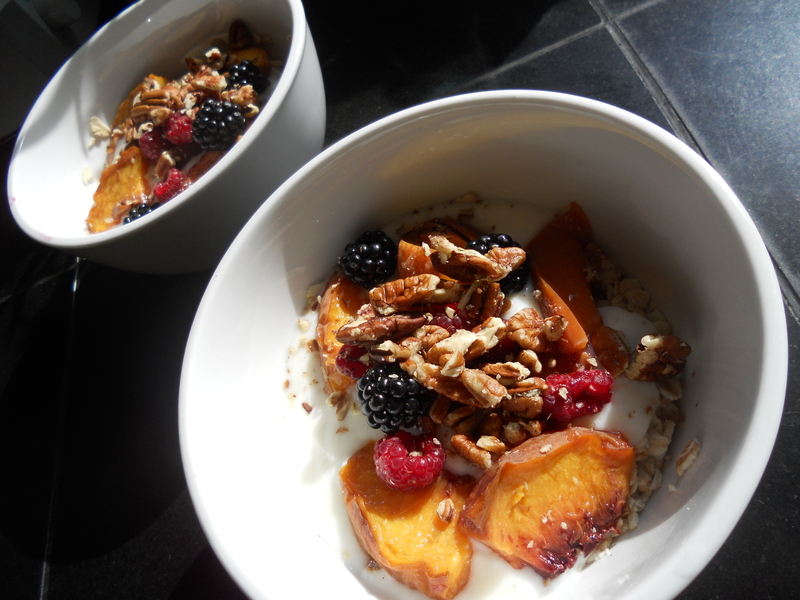 We return to our sunny kitchen and prepare a bowl of oatmeal with yogurt, pecans, fresh black berries, fresh raspberries and a wonderful treat of roasted peaches. Good morning world! 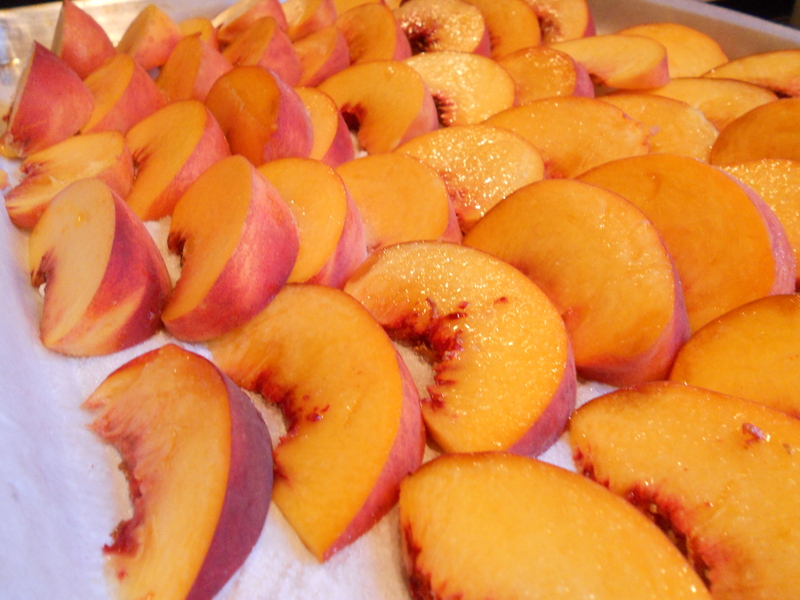 Another favorite peach idea is to use them on a salad. 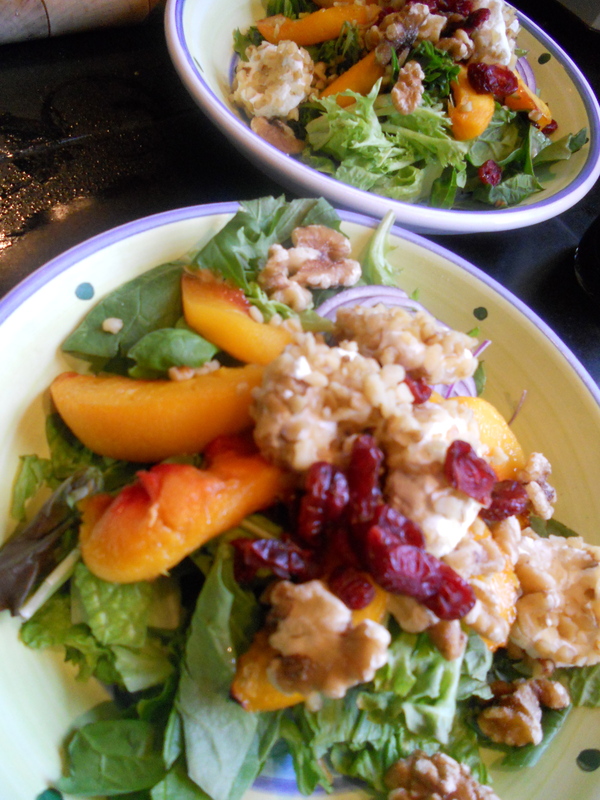 Fresh garden greens, walnut crusted goat cheese, dried cranberries, and maple vinaigrette….so yummy. 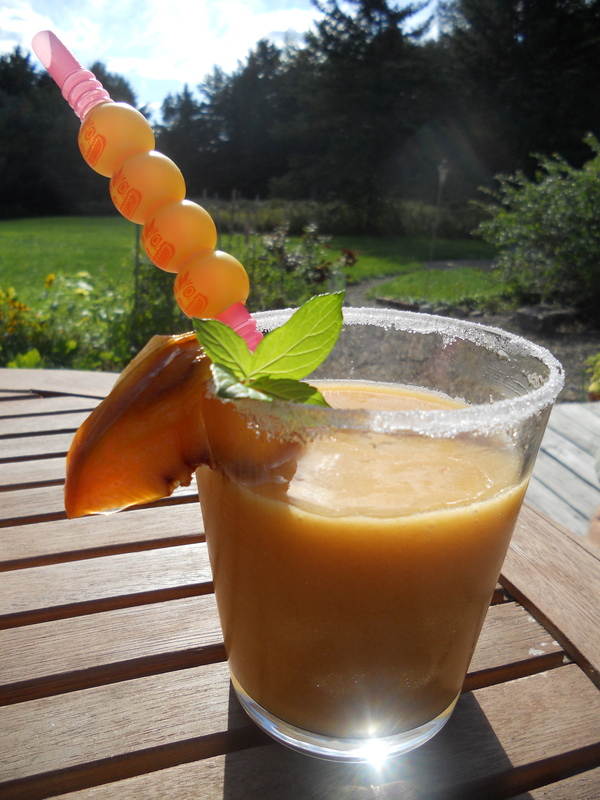 You could always get out your blender…..puree the peaches, add 2 shots of tequila, 1 shot of grand marnier, pour in the peach simple syrup (that is residing in the bottom of the storage container), add a cup full of ice and blend away. Rim a glass with sugar, and pour a tasty “roasted peach margarita”. Sit back, relax and have no regrets about filling that market basket full of peaches! 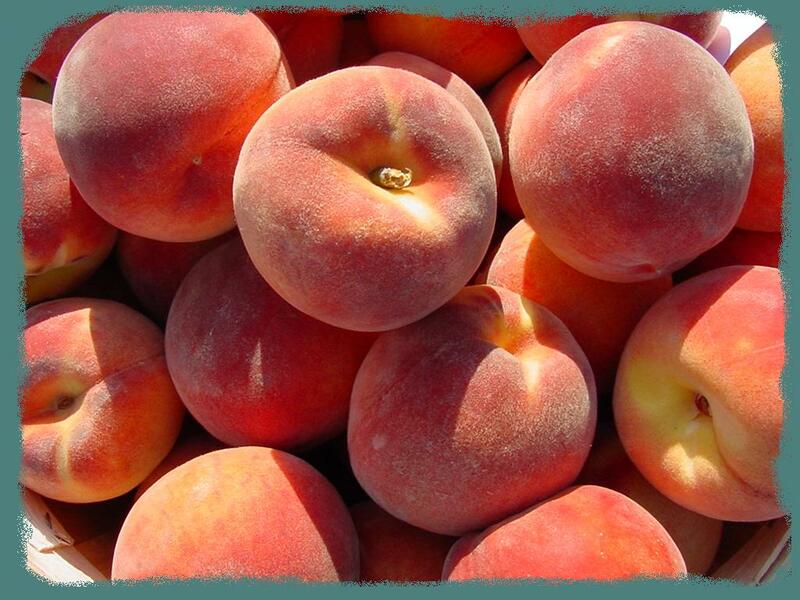 Think about chocolate and peaches…..who has a fabulous idea for chocolate and peaches? Do share. I purchase fresh farm eggs from Josh. He has a chicken coop. I love chickens. 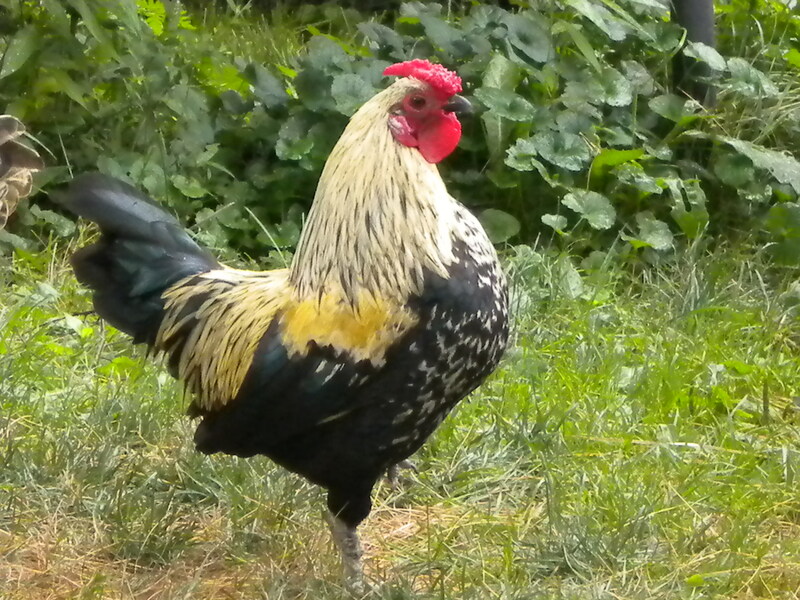 So I ask Josh, “do you have names for your chickens?” His reply, “they are all named Mr. Noodle”…..
It’s the weekend! 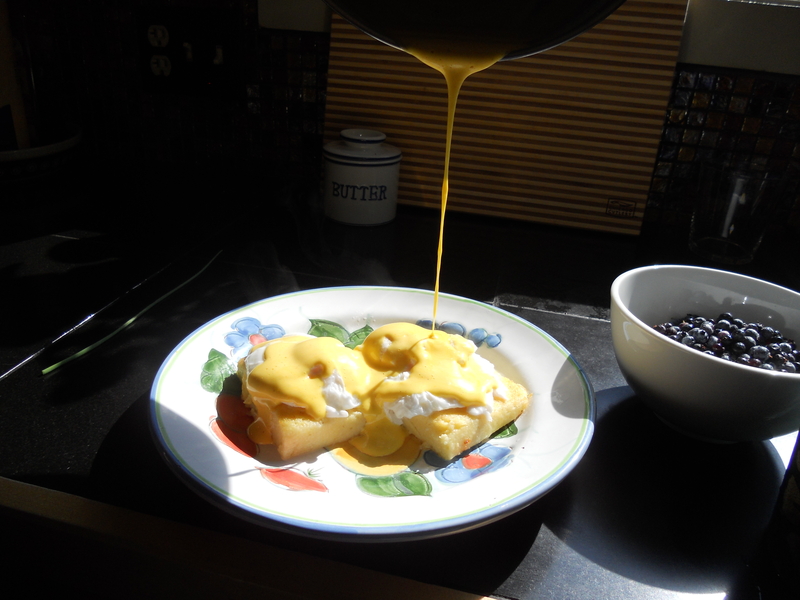 Leszek, my husband, has a request for eggs & hollandaise over polenta; eggs bene without the ham. We begin with Farm fresh eggs from Mr Noodle. 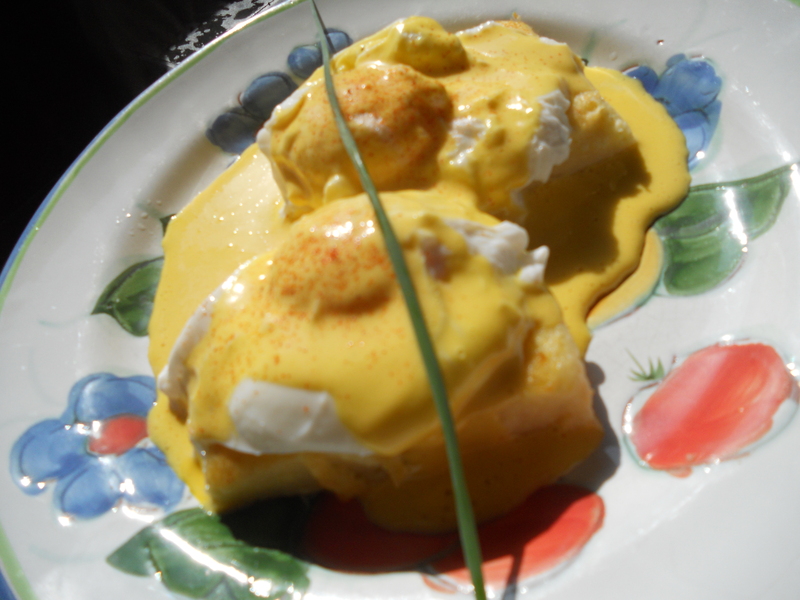 It will be a most sumptuous offering of a classic brunch, but a small amount, just two yolks. 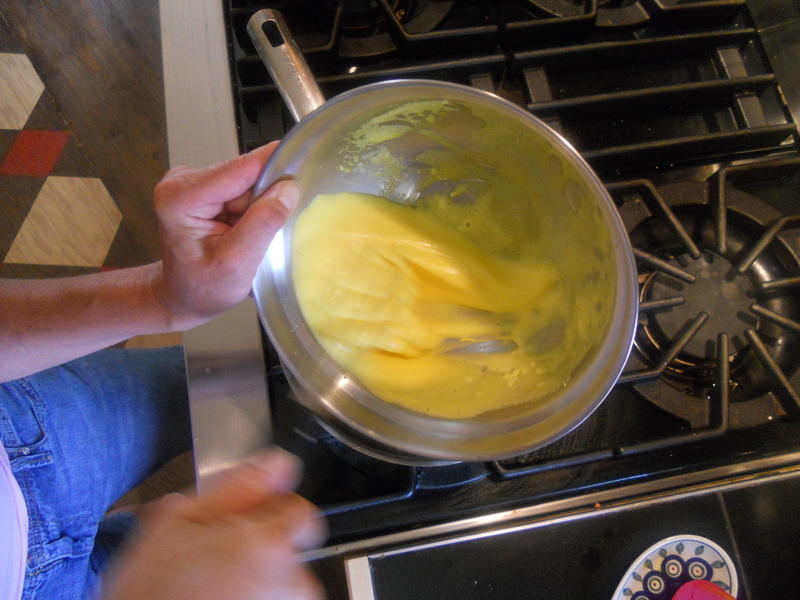 Hollandaise is an emulsion of eggs & butter. Butter warm enough to be melted, but cold enough not to scramble the eggs. 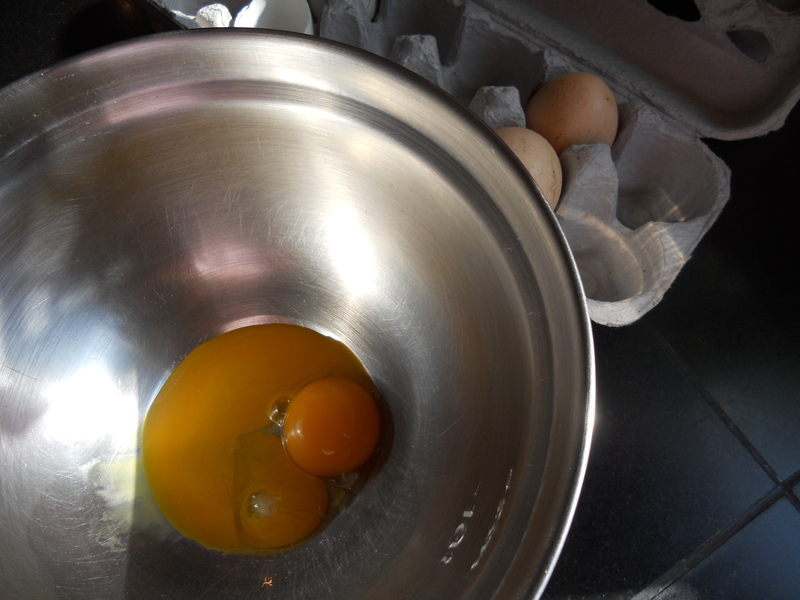 Place your egg yolks & a splash of cold water in a bowl bowl over simmering, not boiling water and whisk whisk whisk! 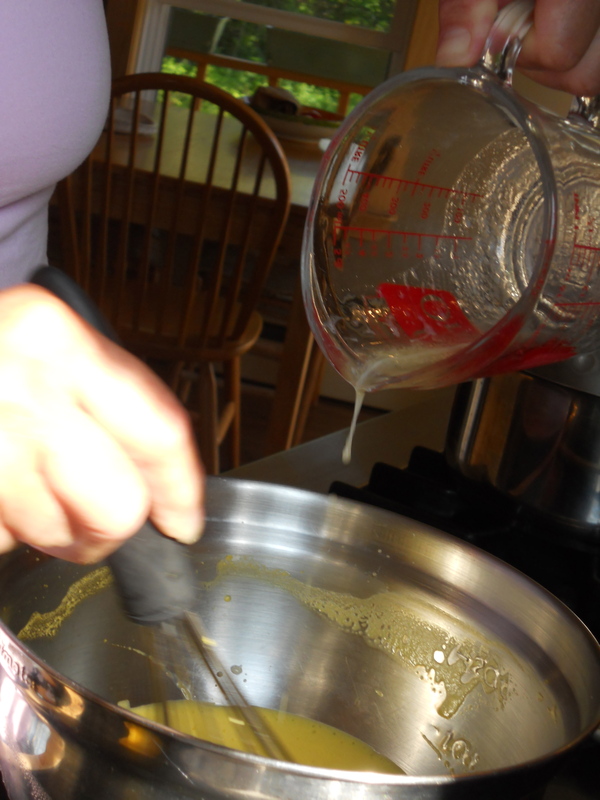 The double-boiler method ensures the eggs won’t scramble over the heat. Keep Whisking until your eggs have the consistency of “whipped cream”. Remove from the heat, place your bowl on a wet towel on the counter (this holds the bowl in place). 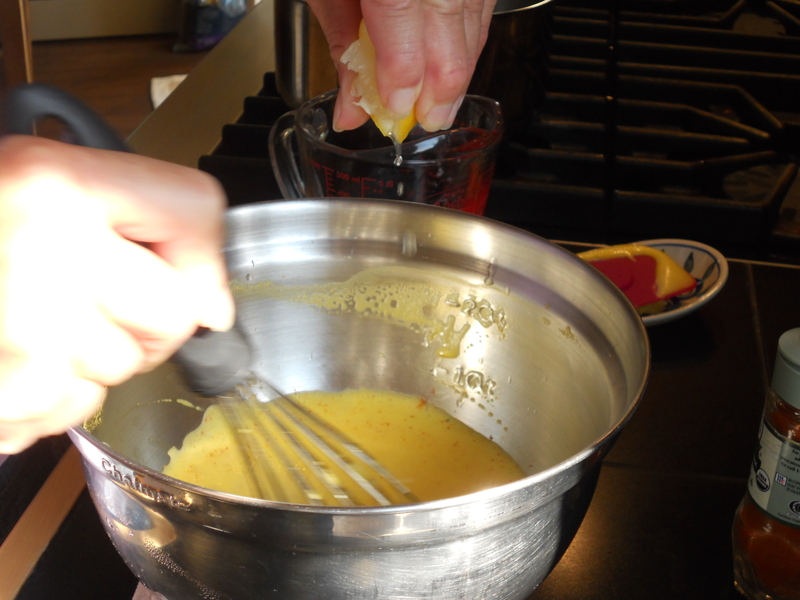 Whisking constantly, slowly add the melted butter……. 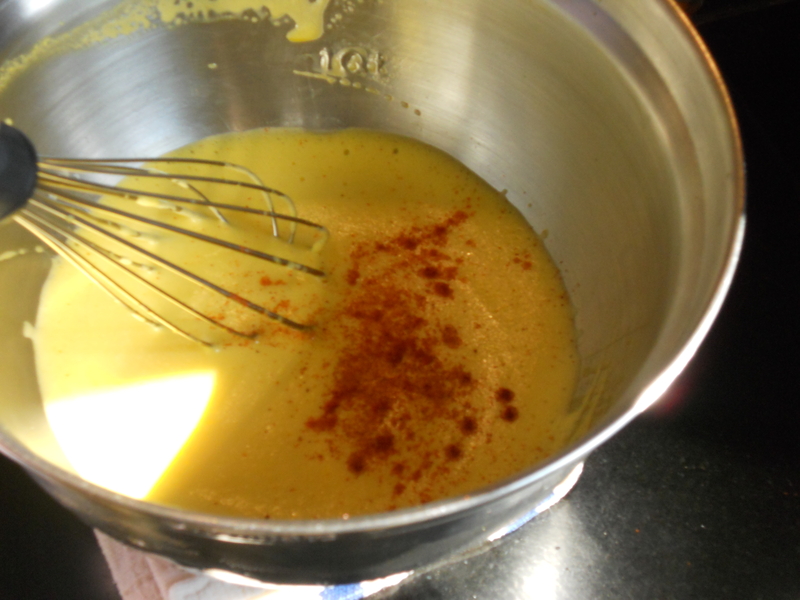 Add a squeeze of fresh lemon…..
A dash of Cayenne, Paprika, Salt and Pepper….. Choose your base. 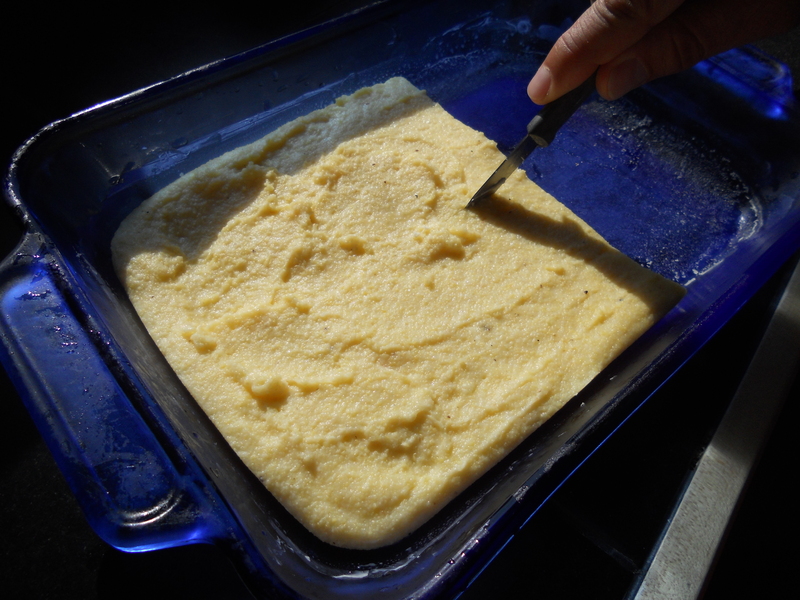 We are using left over Polenta warmed in a saute pan with a little butter. Warning: warming polenta in the toaster does not work. ha ha! I have a mess in my toaster . Prepare a very hot pan of water, not boiling and not simmering. I add about a tablespoon of white vinegar to the water. Crack the fresh eggs gently into the hot water. A freshly laid egg has a white that is almost as firm as the yolk. Do not over cook your eggs. 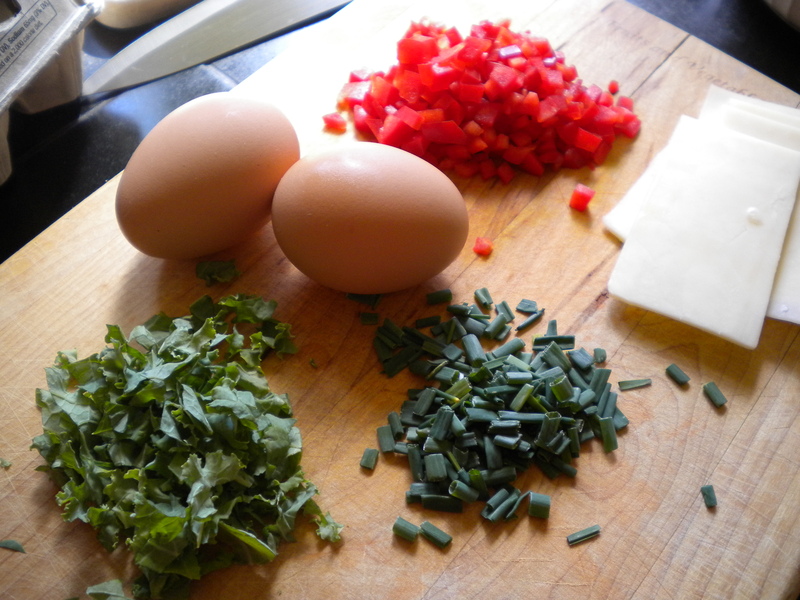 You want to cut into perfectly runny eggs. 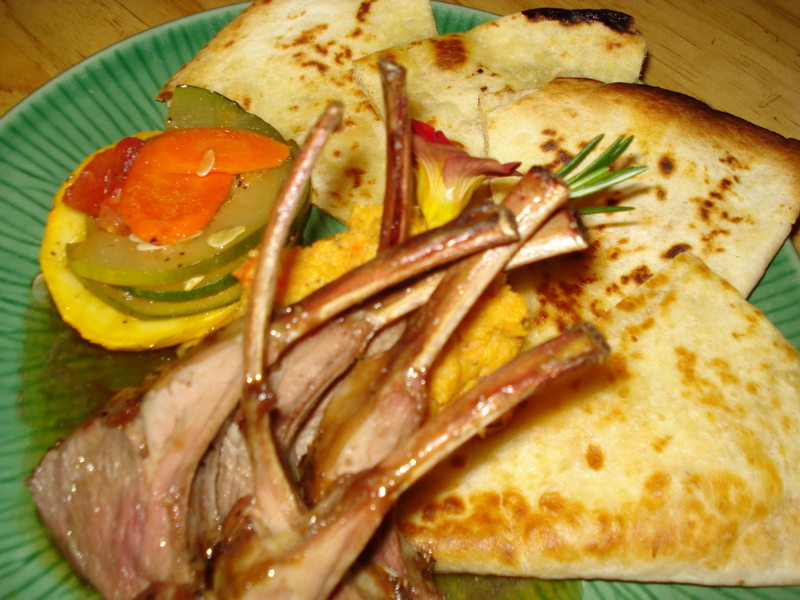 Remove and place on your warm polenta. Add the creamy hollandaise with the proper lemony zing to your eggs and get ready for a delicious rich flavor that will make your tongue dance….. I have stumbled upon an amazing moist yellow cake recipe. Ooooh how I have been searching. 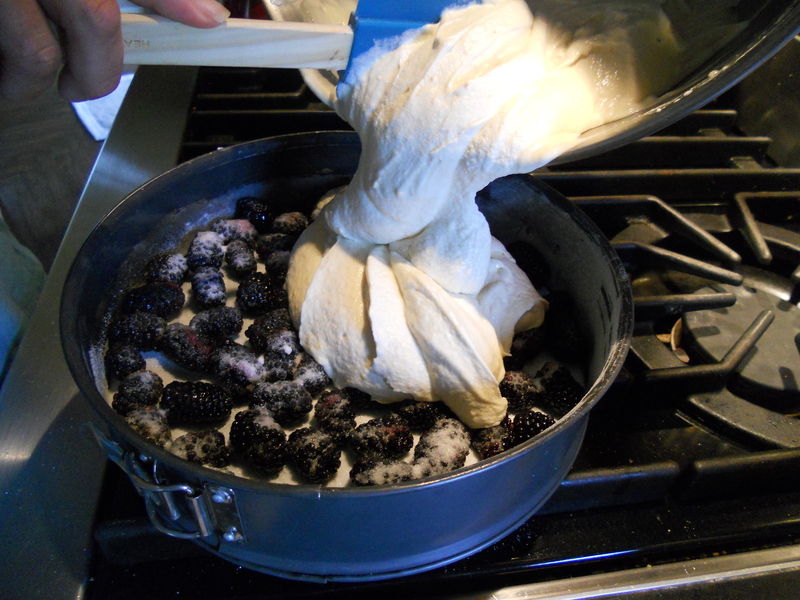 My lovely friends and fellow foodies, this is a recipe to play with, BLACKBERRY BUTTERMILK CAKE. A perfect dessert for the middle of July, inspired by an abundance of sweet summer blackberries and my son Colby is coming for dinner! A sweet and wholesome dessert is just what will complete our summer evening dinner. 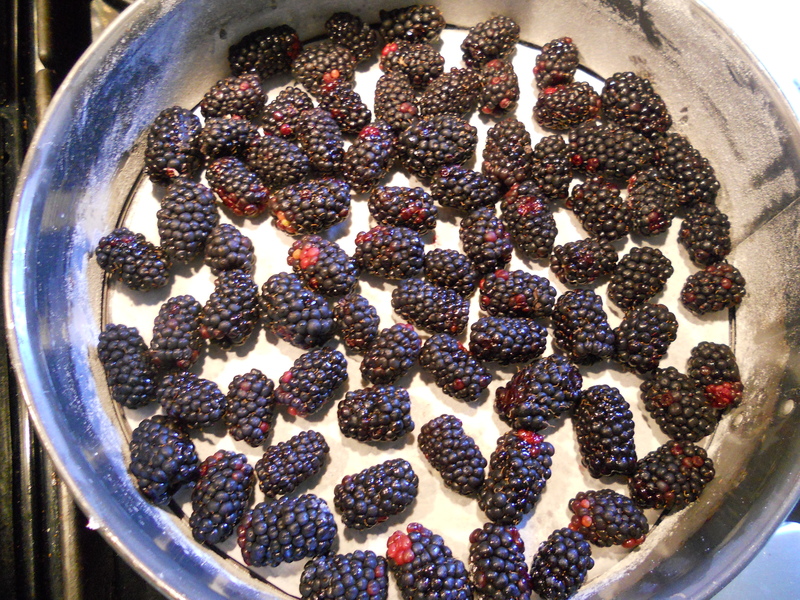 The berries are arranged in the bottom of a spring form pan atop parchment paper and sprinkled with sugar. 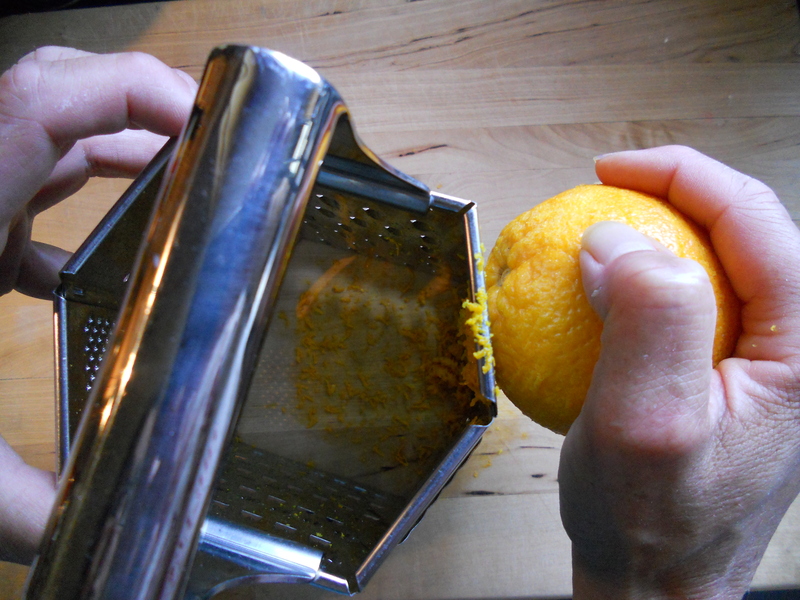 An orange is zested for the cake batter. Just enough to give the cake a hint of citrus. I love every second of this dessert. I can feel it in my happy heart that it will be wonderful. The secret is Buttermilk. Ready for the oven! 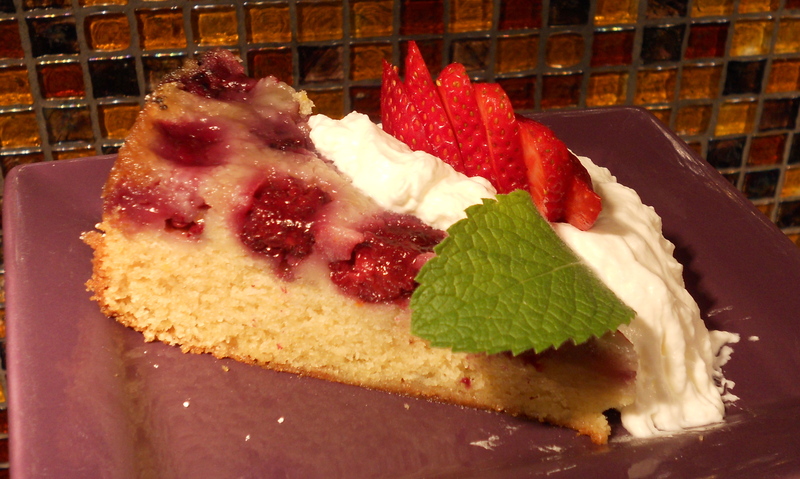 Placed on a sheet pan, as my spring form pan is not trustworthy…..
And what a sweet surprise, moist and fragrant, BLACKBERRY BUTTERMILK CAKE. What an entirely unexpected treat…..I rummage through my cupboards searching for a bottle of cointreau to boost my whipped cream with an intoxicating zing of citrus…. The strawberries, orange zest and blackberries blend well together. Each bite revealed interesting textures and layers of complimentary flavors. I couldn’t help myself from taking “too big of a bite”. Position a rack in middle of oven and preheat to 350°. 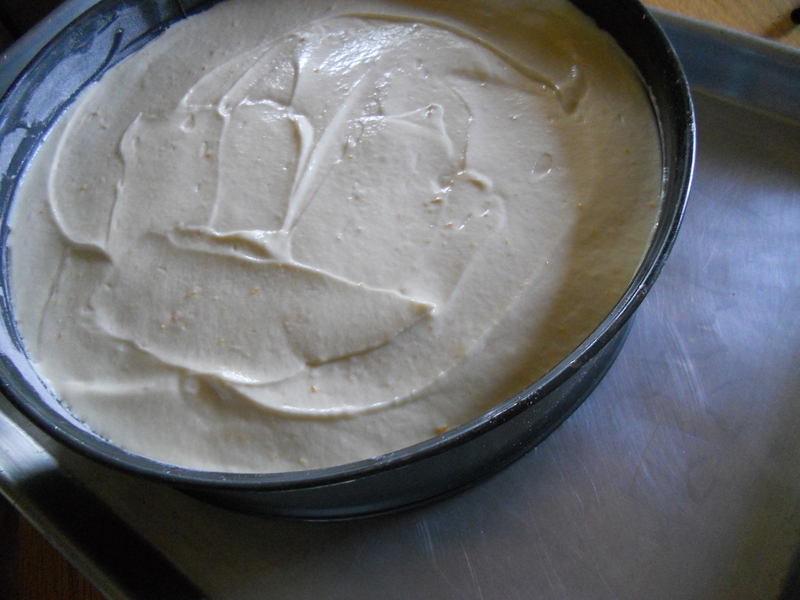 Butter pan; line bottom with a round of parchment paper. Butter parchment. Dust with flour; tap out excess. 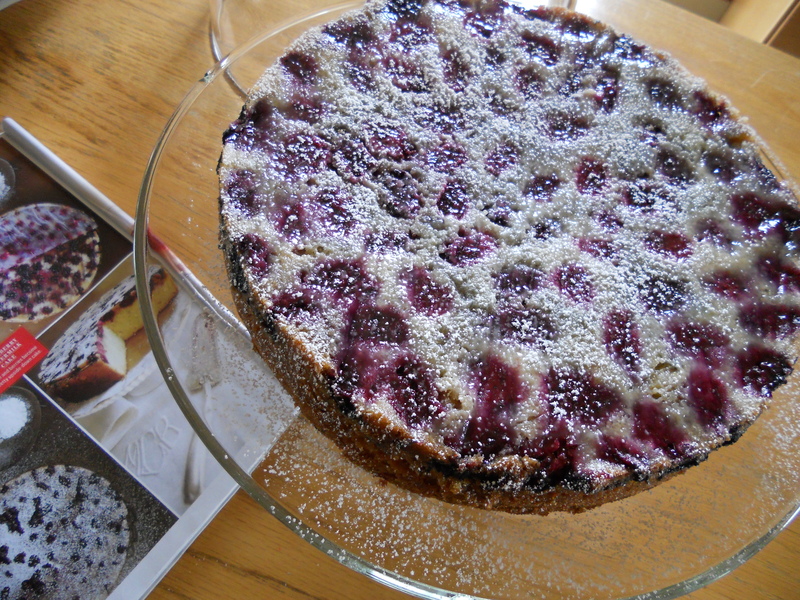 Arrange berries in a single layer in bottom of pan; sprinkle evenly with 1/4 cup sugar. Bake until cake is golden brown and cake bounces back when pressed gently with fingertip, about 1 hour 25 minutes for a 9″ pan and about 1 hour for a 10″ pan. Let cool in pan set on a wire rack for 15 minutes, then run a thin, sharp knife around the edge of the pan to loosen. Remove pan sides. Invert cake onto rack and remove pan bottom; peel off parchment. Dust top generously with powdered sugar and let cool completely. The tomato is a savory edible fruit. Originating in South America, the tomato was spread around the world following the Spanish colonization of Americas. There’s nothing like a delicious garden ripe tomato. But as time goes by, the tomatoes are not quite fresh enough to eat, just a little over ripe…. Don’t throw them away! Roast them in the oven! Slice them and place them on an olive oil coated sheet pan, I use parchment paper for easy removal of roasted tomatoes and easy clean up. Sprinkle with Sea Salt , Cracked Black Pepper and drizzle with good olive oil. You could also add some fresh chopped herbs and garlic. 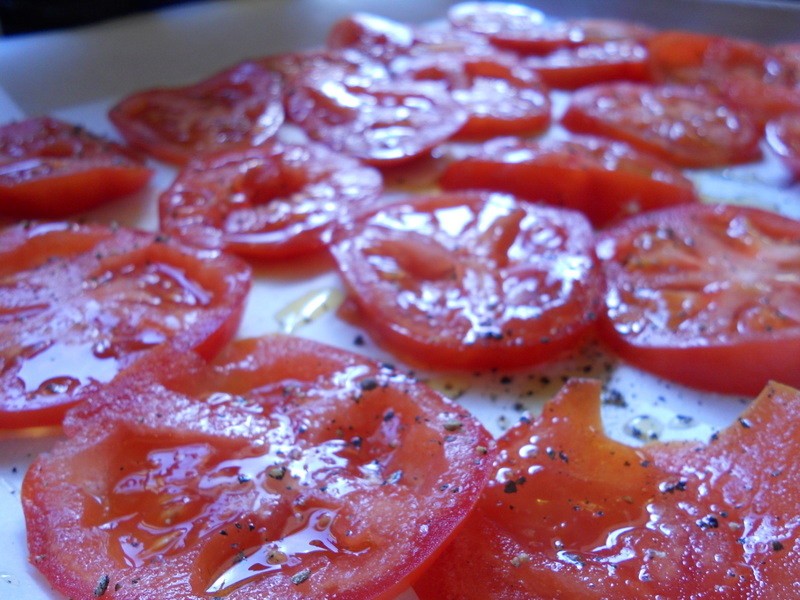 Roast the sliced tomatoes in a 350 degree oven for about 30 minutes, maybe longer. The tomatoes should be a bit darker in color and caramalized…. 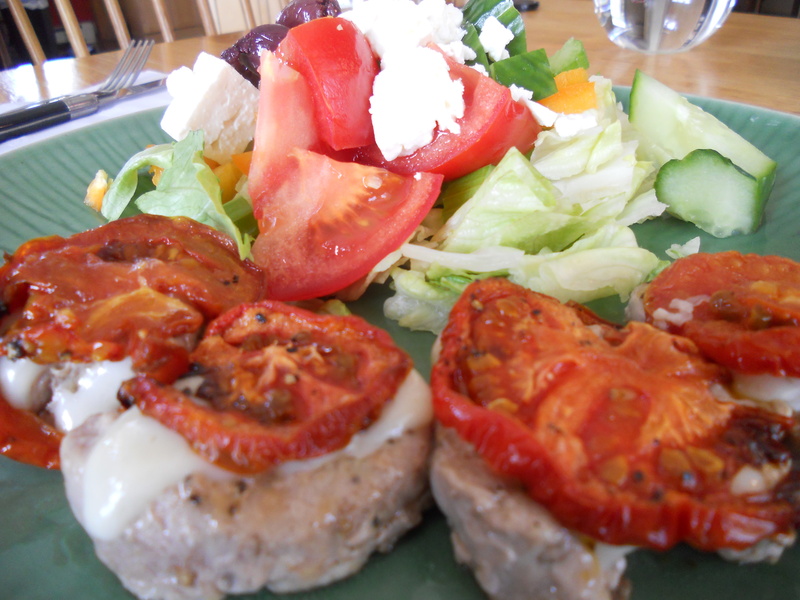 We used roasted tomatoes in this dinner entree of Seared Pork Tenderloin Medallions with melted Fresh Mozzarella. The side Greek Salad is our attempt to avoid a starch with dinner, we’ll save that for another night. 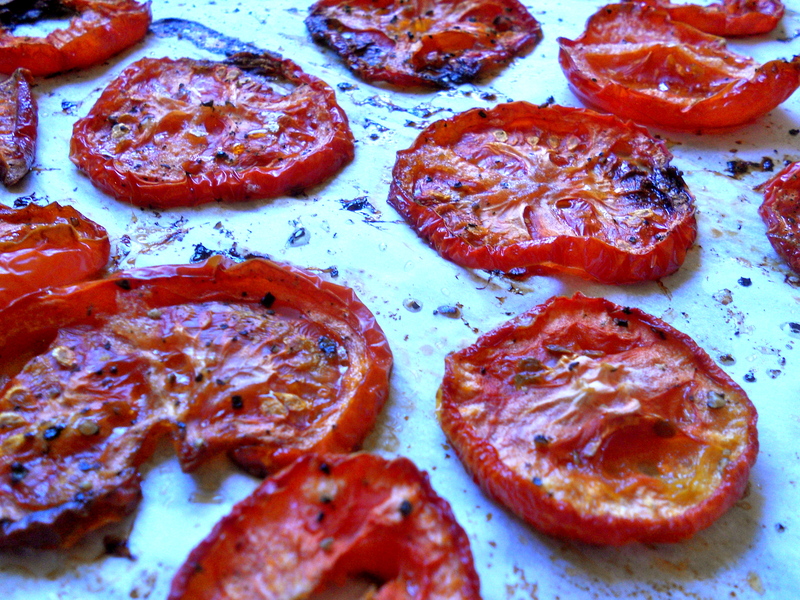 Roasted tomatoes are so flavorful, it’s hard not to eat them right off the pan! Let me know if you make oven roasted tomatoes and send a photo of your creation! Preparing a reduction takes patience. 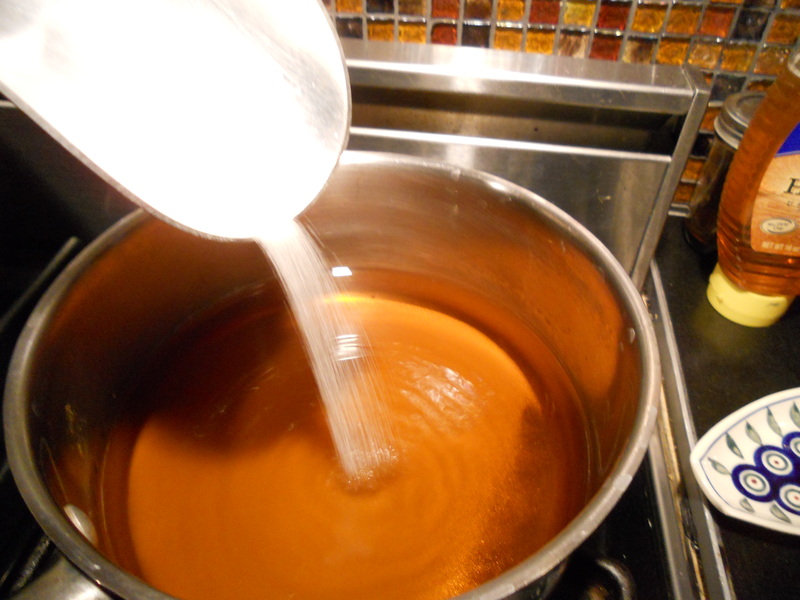 Cook your choice of 2 cups liquid & 2 cups sugar over medium heat for about 30 minutes or until you notice it thickening. Remove from heat and let it cool. Be careful, I have left the kitchen while reducing red wine, simple syrup, balsamic vinegar or a bourbon, only to return to a bubbling thick sticky substance impossible to remove from the pan. So stay in your kitchen. Keep an eye on your reduction. It’s worth it. My son Colby would like a Bourbon reduction. It’s terrific on pancakes, chicken, lamb chops or even drizzled on a salad. 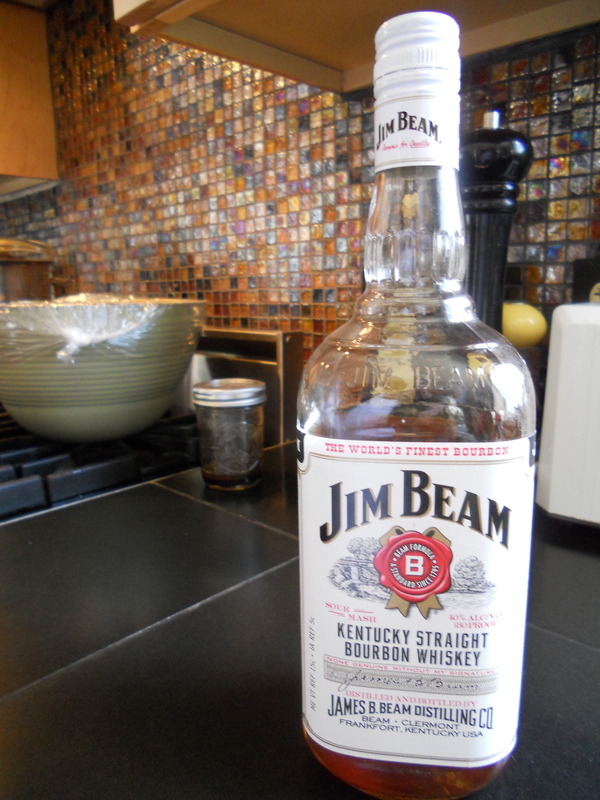 I found a bottle of Jim Beam in the basement. I will not be drinking it. No bourbon or whiskeys for me. In my younger years I would fill my empty McDonalsds soda cup with my Dad’s Canadian Lord Calvert……no fond memories of that flavor! But my son, true to his Irish blood, is the whiskey drinker in the family. MIX DRY INGREDIENTS. 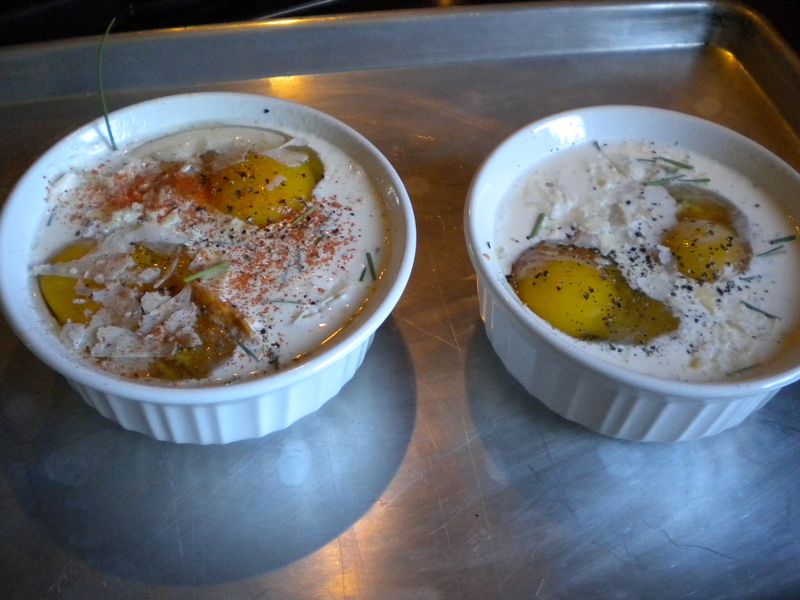 MIX EGGS, OIL, & BUTTERMILK. ADD TO FLOUR MIXTURE ALL AT ONCE. STIR JUST TIL BLENDED, BATTER SHOULD BE LUMPY! COOK OVER MEDIUM HEAT IN CLARIFIED BUTTER. 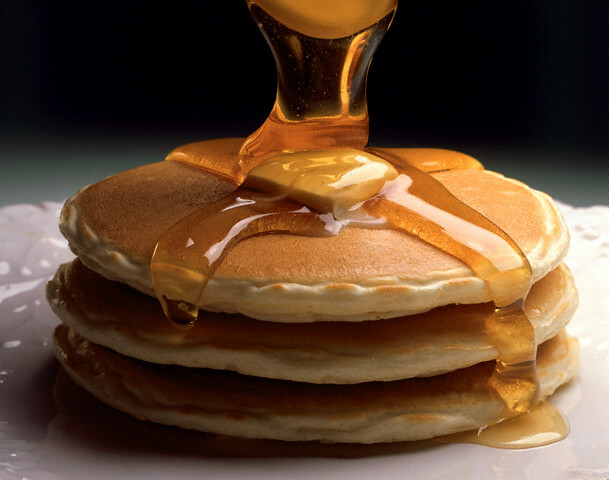 FLIP YOUR PANCAKE WHEN THE EDGES START TO BUBBLE. SOOOO….GOOD! You wake up wanting something savory. Your taste buds would like something that requires dunking…. 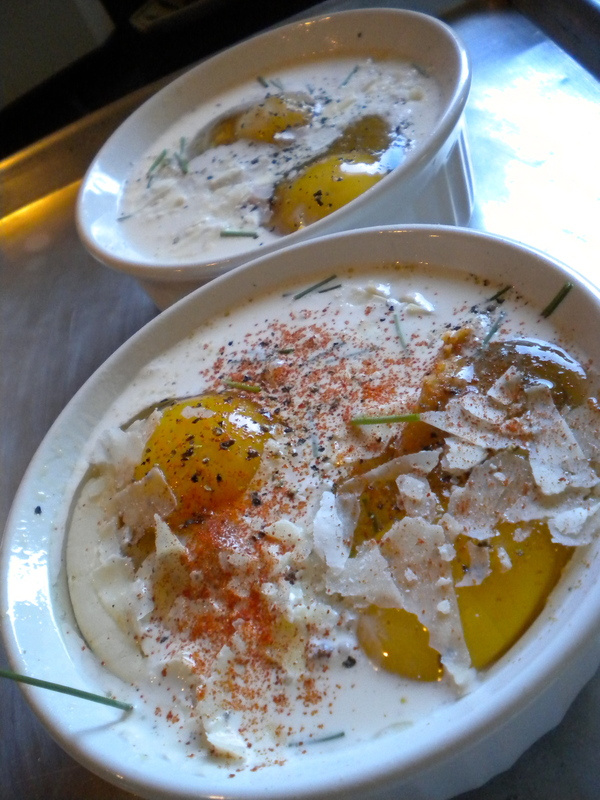 Delicious Baked Eggs and Cream! 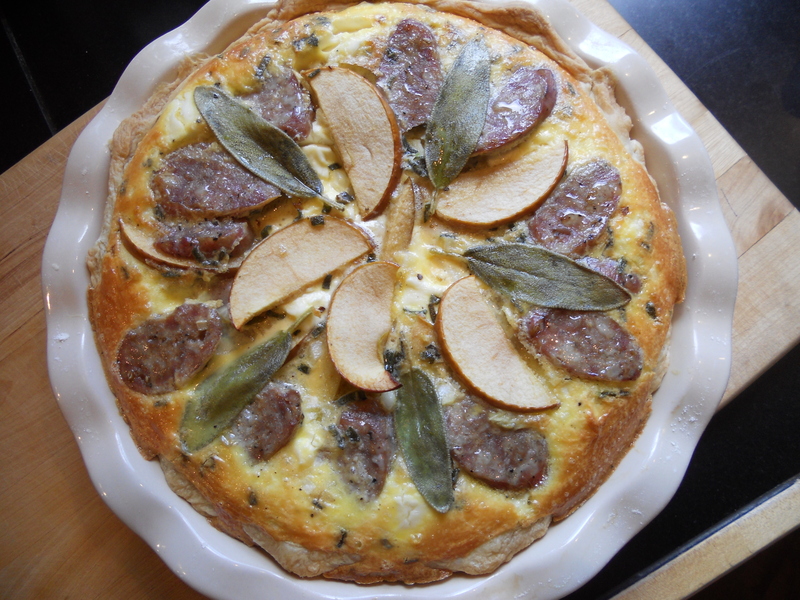 How about a savory pancake to accompany your dish of baked eggs? A fresh chive pancake from the griddle waiting to be immersed in the cheesy goodness. It is one of the richest dish of eggs you will ever eat, yet so tasty you will be compelled to eat every last bite. Start with fresh ingredients. Your basic ingredients are two eggs & cream. You can add anything to the ramekin. 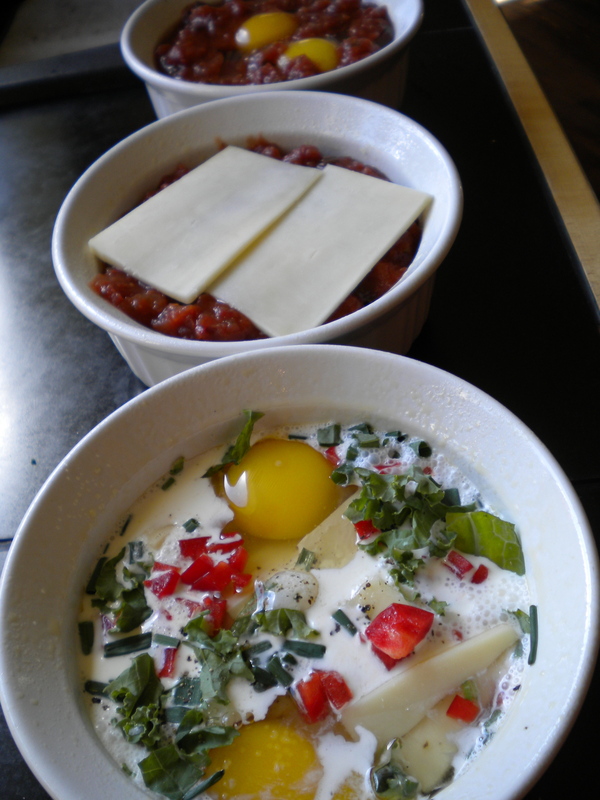 Place a little cream in the bottom of the ramekin, add a little cheese, add a few ingredients, here we have added fresh chives, sweet red pepper, scallions and sliced montery jack cheese. My husband added a little salsa to his. We also baked some with cream, fresh grated parmesan & chives. Gently crack in two eggs. Add more cream and fresh ingredients. Maybe a little salt & pepper. Be sure your yolks are showing so you can check them when they are baking. Place your filled ramekins on a sheet pan and bake at 400 degrees for 12 minutes. LINKS TO SOME COOL BLOGS!